ET41-113 hauling a Koleje Mazowieckie Warsaw-Radom train. I used to regularly travel the Warsaw-Radom route but never enjoyed such super power haulage as captured recently in this photo by Michael Dembinski. The ET41s double units are usually employed hauling heavy coal trains between Silesia and Gdynia. Steam trains better than railcars in the snow. 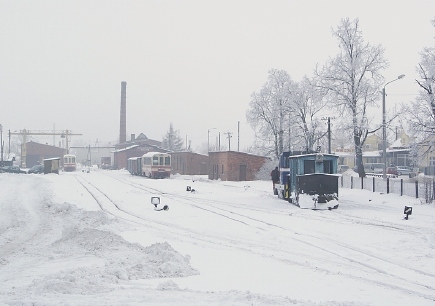 The Wolsztyn Experience website reports that the railcars which operate the majority of Wolsztyn – Poznan services have struggled to cope with the deep snow. The extreme cold weather in Europe has this year produced more snow in Wolsztyn than the last few years with 12 ins in early January. On Jan 4th the steam service from Wolsztyn hauled by Pt47-65 was the only on time arrival at Poznan in the morning rush hour. Delays on some days have been caused by the railcars which have struggled in the deep snow; however, having waited to pass a railcar running some 20 minutes late on Sunday 3rd Jan, the Pt recovered 15 minutes of the lost time. Old technology once again proves its worth in extreme conditions. Wojtek Lis reports on his Wiadomosci z Parowozowni w Wolsztynie website that on Saturday afternoon a railcar travelling from Poznan to Wolsztyn became stuck in the snow at Mlyniewo near Grodzisk Wielkopolski. A diesel locomotive sent to assist the train as well as a rotary plough failed to free the railcar. Finally the crew of the snow plough were joined by the Grodzisk Wielkopolski fire brigade and the two teams together managed to dig out the railcar from the snow by hand. 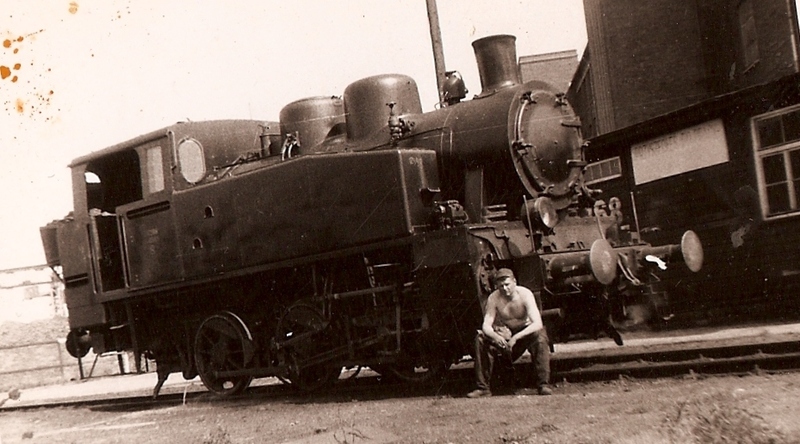 Meanwhile the following train hauled by 2-8-2 Pt47-65 was held at Grodzisk Wielkopolski where it spent the whole night! Its passengers were taken to Wolsztyn by the last PKS service of the day, while the Pt47, using its last reserves of water, reached Wolsztyn at 05:40! Today’s 05:11 Wolsztyn – Poznan working left Wolsztyn at 07:28. Watchdog slams ‘unfair’ promotions, but is UOKiK’s fine fair? PKP Intercity has been fined 2,282,390 million PLN (approx. 0.5 million GBP) by the Urzad Ochrony Konkurencji i Konsumentow (Office of Competition and Consumer Protection) for practices which the Commission claims breach Poland’s consumer protection laws. But is UPKiK’s fine itself fair? In January 2009, Malgorzata Krasnodebska-Tomkiel, the chairperson of UOKiK commenced proceedings against PKP Intercity to establish whether the regulations which governed the sale of certain PKP Intercity tickets infringe the rights of passengers. UOKiK checked the conditions attached to Intercity’s special offer tickets: Bilet weekendowy (Weekend), Bilet podróżnika (Traveller’s), Wcześniej i Taniej (Advanced). They were particularly interested in the ability of passenger’s to obtain a refund for an unused ticket as well as the conditions relating to purchases of tickets through the Internet. The Weekend and Traveller’s tickets gave passengers the right to travel on an unlimited number of Intercity trains from 19.00 hours on Friday to 06.00 hours on Monday morning. PKP Intercity insisted – quite reasonably in our view – that if you purchased such a ticket and wanted your money back you had to hand it in before the period for which it was valid. The advanced ticket had to purchased 15 days in advance of when the journey was to be made and if you wanted a refund had to be handed in at least two hours before your journey was to commence. Mrs Krasnodebska-Tomkiel has ruled that these restrictions are unlawful and has fined PKP Intercity the equivalent of 0.5 million GBP. Someone should point out to her that if you want a cheap ticket it is not unreasonable that extra restrictions are bundled in with its sale. In the days when I was sent around Europe by air my employers purchased Club class tickets and I changed my flights and carriers as if I was hopping on and off trains on the London Underground. Now that I buy my own tickets and travel on the low cost carriers at ridiculously cheap fares, I do not think it unreasonable for the carrier to keep my money if I decline to travel. PKP has announced its intention to appeal against the UOKiK decision to the Competition and Consumer Protection Court. If the ruling is upheld it will be a victory for the road lobby – passengers will pay the fine in the form of higher fares and Intercity’s ability to attract new passengers through special promotions will be severely curtailed. Meanwhile genuine abuses by Intercity of its monopoly position go unpunished. A reader writes that for the last fortnight he has been trying to make an advance purchase some 50 tickets for a group journey right across Poland which is to take place at the beginning of March. (Tickets are supposed to be on sale from 60 days before the departure of a train.) He regularly purchases group tickets and has already received payment from his customers. You would have thought that such a customer would have his own account manager and receive VIP treatment. Not a bit of it. Intercity have blocked the sale until tomorrow when the company raises its prices! A picture postcard scene on the Kolin Sugar Beet Railway. Photo KŘD. 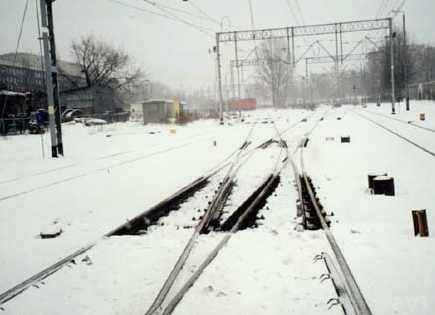 A classic winter scene on the Kolin Sugar Beet Railway – a 19th C station and engine shed, various items of ancient rolling stock, a level crossing barrier and the outline of the rails barely visible through the snow. However, a careful perusal of the KŘD website reveals that nothing in the photograph is quite as it seems. The Kolin Sugar Beet Railway was constructed in 1894 by Adolf Richter, a grand-son of the knight Frantisek Horsky. It was the oldest sugar beet line in Bohemia. It used to lead from Kolin sugar rafinery to Frantiskov (Ovcary), to Bychory and to Jestrabi Lhota. The total length was 10.6 km, the branch line to Frantiskov was 0.9 km long. It survived into the early 60s. When the line was closed the track and anything made of steel was sold for scrap and its wooden wagons were sold to serve as sheds in gardens and farms. All that remained was the old railway alignment. Now thanks to the KŘD – the Society that is driving the rebuilding of the line, the support of local authorities and businesses, and a 0.5 million euro EU Regional Development grant, the line is slowly coming back to life. Some 2.6 km of track have been relaid, ancient wagon bodies restored and new passenger coaches constructed, several small diesels and an 0-4-0T steam locomotive acquired and restored. While not on the scale of the Welsh Highland project, the rebirth of the 600mm Kolin Sugar Beet Railway – given the financial constraints operating in Eastern Europe – is just as impressive. Is it too much to ask that the Polish local authorities, bureaucratic and unhelpful when it come to their own narrow gauge railways, could learn from their neighbours in the Czech republic? Building Zeleznicka Station and engine shed. Photo KŘD. Train indicator at Warszawa Wschodnia on 14.01.2021. PKP’s response to Mike Dembinski’s post on W-wa Jeziorki that Warsaw suburban trains are running very late. Sign of better times to come? The noticeboard at the entrance to the Karsnice Skansen. One of the ex Gubalowka cable railway coaches can just be seen peeping through the foliage in the background. Photo Marian Maroszek. Good news for the ‘Forgotten Railway Museum’ at Karsnice. Kolejowa Oficina Wydawnica (The Railway Publishing House) reported on Monday that at long last negotiations between The Town and Municipal Authority of Zdunska Wola and the PKP Estates Department had concluded and that as a result the Authority had acquired a perpetual right to use the railway land, valued at 604,000 zloty (approx. £130,000), occupied by the Skansen. At the same time PKP transferred the ownership of locomotives and rolling stock worth, some 354,000 zloty (approx. £75,000). The Skansen is the brainchild of one man, Marian Fijolek, the former General Manager of the locomotive repair works at Karsnice. Mr Fijolek set himself the task of collecting one example of every steam locomotive that ever worked on the Magistrala Weglowa (Coal Trunk Line) between Upper Silesia and Gdynia. Mr Fijolek also collected numerous small exhibits, a working model railway and a complete vintage train of ancient four wheel carriages. Other exhibits at Karsnice include a portable steam engine, a giant wheel lathe and the old coaches from the cable-hauled railway on Gubalowka in Zakopane. Sadly all the large exhibits, including the steam locomotives, but not the vintage coaches are – as is common in all Polish railway museums – stored outside in the open. At its peak Mr Fiolek’s collection included 9 main line steam engines and3 small industrial steam engines. Sadly, during the protracted negotiations, some of the locomotives were sold by PKP and have gone elsewhere, while a number of locomotives are owned by Warsaw Railway Museum which reportedly wants them back! Nevertheless, the exhibits being handed over for safe keeping to the Town Council include 5 steam locomotives (including Ty 42-9, Ty 45-39, Ty 43-1), 3 diesels (SM 41-175, SM 30-39, SM 03-41) and one electric locomotive (ET 21-01). Let’s hope that under the custody of the Council the decaying locomotives and rolling stock at Karsnice will be properly looked after and that the Skansen will be forgotten no longer. Unlike Poland’s tourist narrow gauge railways, SKPL’s freight-carrying n.g. lines operate all the year round. Snow plough in action in Smigiel yard on 14.01.2010. Photo Albert Mikolajczyk, SKPL. A double slip or in Polish rozjazd angielski (literal translation ‘an English point’) with electrically heated stock rails. Photo PKP PLK. Given Poland’s frequent freezing winters, PKP had fine tuned the railway’s response to perfection. Thermostatically controlled automatic point heaters which came on at a pre-determined temperature were part of the railway’s defences against snow and ice. So why have hundreds of trains been delayed this winter by points that froze solid? The story starts with the Ministry of Infrastructure who when reorganising Poland’s railways decided to improve on the British model. When PKP was broken up into hundreds of separate companies, instead of just hiving off infrastructure into a single company the Ministry split up infrastructure into PKP Polskie Linie Kolejowe (track), PKP Energytka (electricity supply) and PKP Telekomunikacja (telecommunications). Each company is looking for ways of earning more money and PKP Energetyka is no exception. When PKP Energytyka boss Tadeusz Skobel thought up a scheme whereby he would charge PKP PLK not just for the electricity consumed, but for the infrastructure company’s potential to use electricity he thought he had hit a jackpot. PKP PLK chairman, Zbigniew Szafranski, countered Skobel’s move by order the electric point heaters to be disconnected. After all Poland had had a run of several mild winters in a row. Thousand’s of delayed trains and hundreds of thousands of late journeys is the result. It is time for Andrzej Wach, the chairman of PKP SA to sort out his two daughter companies. If he feels powerless to sort matters out, then rail minister Juliusz Englehardt should act decisively to end this nonsense. Familiar 0-6-0T in in an unfamiliar location. Photo BTWT archive. Much to Dyspozytor’s delight, our first mystery location continues to elude our readers. Robert Hall guessed Ketrzyn which is close, but only by means of a piece of left-handed lateral thinking. John Hyde, who we hope will be getting his bottle of Zubrowka quite soon, guessed Huta Kosciuszko which is wrong, but does have a vertical relationship to the place we are looking for. There’s a lovely sketch about travelling long distance by rail in Poland on Chris Thornborrow’s blog in an article entitled, An Englishman in Poland: The first 6 months. Chris writes with evident relish about the joys of travelling by train across Poland in 2003. Each weekend I would take a train for 5.5 hours to Warsaw. Polish trains in those days were an adventure. Still this train was largely empty and so sleeping in an empty carriage was possible. Half way through the journey the train would split into two halves. I only found this out by sleeping in the wrong half once. Trains in Poland were not as bad as people said though. They were always on time or within a few minutes, nothing like English trains whose arrival times are best described using a gaussian distribution curve with a long tail. Nontheless, you needed to be on your toes. The beer sellers would come on at each station and offer cans of beer at much cheaper prices than the railway bar. Once a man came in my carriage as I was dozing and announced “lodowka” – fridge. It was snowing and I assumed he was cold, so I tried to explain he was welcome and we could turn the heating up (it worked in about 50% of trains). “Lodowka” he shouted. After one more attempt, angry as hell at my lack of response, he left calling me some colourful things. Apparently, he had said “zlotowka” – meaning in effect, “Spare some change?”, and the ignorant foreigner had turned the heating up instead. So, 6 years later and many 100s of millions of euro EU grants later, how long does it now take to travel from Zielona Gora to Warsaw? The only reasonable through train (reasonable price, reasonable time of departure) takes 5 hours 45 minutes. However, if you prepared to catch a train at 04:23 in the morning and pay triple the price, the journey can be done in 4 hours 45 minutes. Some things don’t get better, they just get more expensive. (Click on image to go to auction site). While the aims of WOSP (The Great Orchestra of Christmas Charity) are above reproach, the decision by PKP bosses to donate ‘preserved’ steam locomotive Ty51-133 from Chabowka is a decision of crass stupidity. There are plenty of decaying PKP steam engines stuck in various sidings and if PKP really wanted to donate a steam engine it should have chosen one of these locomotives rather than one that is part of the collection of Poland’s best railway museum. So far no bids have been placed for Ty-51-133. This is perhaps not surprising as the locomotive had one of the heaviest axle weights of any Polish steam engine – a static weight of 20.6 tonnes on the rear axle which combined with the effects of hammer blow from the motion could result in dynamic loads greater than 21 tonnes on the track. So, even if the locomotive was restored to working order, PKP would be unlikely to let it run. I glanced at some of the other items that can be bid for on the WOSP auction. With a current bid of nearly 152,000 zloty (some £33,500) the red BMW Z4 Coupé donated by BMW dealers association has yet to reach its reserve price. If it doesn’t do so by the end of the auction, does this mean that the BMW dealers get to keep the car? Make a more affordable 21,000 (£4,600) zloty bid and you could end up with an 8 hour voyage in a submarine belonging to the Polish Navy, while a similar amount could put you in the co-pilot’s seat of one of Poland’s latest F16 fighter bombers. A more modest 13,000 zloty (under £3,000) bid would let you you and four friends spend a weekend in the President’s country retreat, Zamek Wisla. These ‘experience’ donations point the way that PKP should have helped WOSP, involving lots of potential customers and gaining itself good PR into the bargin. How about a batch of railway experiences? How about, first class tickets for two to go to for an all expenses paid trip to London by train travelling by Jan Kiepura, Thalys and Eurostar; and similar first class trips to Berlin, Brussels, Cologne, Moscow, Paris and Rotterdam? Other more modest PKP ‘experience’ donations could have included a batch of cab rides on some of PKP’s more exciting routes like Krakow – Zakopany or even Poland’s longest railway journey, Szczecin -Przemysl. With the discounts available to PKP for rail tickets plus the ability to tie-in publicity deals with the hotels where the winning bidders could stay, the whole jamboree could comfortably have been accommodated within a budget of 50,000 zloty (say £10,000). The result would have created new friends and favourable publicity for PKP, instead of the anger and frustration caused by the auction of TY51-133. If you care about the future of Poland’s railway heritage and the skansen at Chabowka do please put pen to paper (or fingers on keyboard) and write! 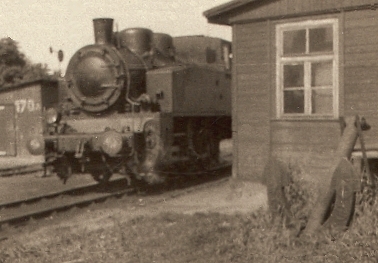 Ty51-133 at Chabowka. Photo PKP Cargo. PKP bosses showed that they do not care a fig about the future of Poland’s railway heritage, by ‘donating’ PKP Cargo’s Ty51-133 to Poland’s annual charity jamboree Wielka Orkiestra Swiatecznej Pomocy (The Great Orchestra of Christmas Assistance). In one stroke they have also struck a blow at Poland’s best kept railway museum – the Skansen at Chabowka. Ty51-133 was built by HCP Poznan in 1956 and spent its whole entire active life working on the industrial railways in Upper Silesia administered by the Przedsiebiorstwo Materialow Podsadzkowych Przemyslu Weglowego (PMPPW). In 1993, thanks to efforts of Krystof Jakubina of Pyskowice, the locomotive was taken into PKP Cargo’s stock and sent to Chabowka. The Chairman of PKP, SA. To all our readers who have supported our campaigns in the past, my grateful thanks. Children’s Day train on the Wyrzysk Narrow Gauge Railway in May 2009. The Wyrzysk Narrow Gauge Railway is the largest surviving fragment of a great 600 mm gauge network which, in the 1950s, encompassed 256 route kilometres and was known as the Bydgosko Wyrzyskie Koleje Dojazdowe (The Bydgoszcz and Wyrzysk Local Railways). In addition to the 30 km of track which commences at Bialosliwie, an isolated 5 km of the line survives at Mochle, as do the station sidings at Trzeciewnica. Some of the line’s track and rolling stock was used to create the Myslecinek Park Railway in Bydgoszcz. Many of the steam engines that once worked the line survive… but now work in places as far away as Germany, Sweden and the United Kingdom. The survival of the Wyrzysk Narrow Gauge Railway owes much to the efforts of the Towarzystwo Wyrzyska Kolej Powiatowa (The Wyrzysk District Railway Society). The TWKP are a volunteer-run association who have heroically battled over the last 10 years to ensure the preservation of at least a fragment of line. Today, having invested an enormous amount of their own time and money in restoring track and rolling stock, the Society acts as the line’s operator, but without any kind of long-term agreement from the Pila District Council who after some 7 years of negotiations are just completing the formalities of taking over the freehold of the line from PKP. The conclusion of the takeover formalities should be a cause for rejoicing all round, were it not for two matters which give rise to suspicion. First of all Tomasz Bugajski, the Chief Executive of Pila District Council, has insisted on taking over the line without the customary condition being imposed that the line must subsequently be used for transport purposes, secondly he is now insisting on holding a tender to choose the line’s future operator. Cynics may wonder whether Starosta Bugajski has other plans for parts of the railway land and is looking for a company that will sell most of the track for scrap and establish a funfair style park railway on only a short section of route. Piotr Rogadzinski, the TWKP chairman, has called for an urgent meeting with District Council officers to try to obtain clarification of the Council’s intentions. The erstwhile Bydgoszcz and Wyrzysk Local Railways probably deserve a full-length feature article in the pages of BTWT. Any volunteers? From Warsaw to Basle by sleeper? Certainly, if you pay us to fax Belarus! Polish coach on Jan Kieura sleeper train. Photo The Man in Seat Sixty One. The Jan Kiepura is a very useful train. It leaves Warsaw at 18:10 travels to Berlin and then splits, sending its various carriages to useful destinations in Germany and beyond. It is even possible by changing at Utrecht and Rotterdam to arrive at Hook of Holland in time for the 14:30 afternoon ferry to Harwich and and thence by National Express East Anglia to London Liverpool Street for 22:16. Until December, passengers travelling from Poland to various destinations in Europe could directly book their tickets directly at PKP InterCity ticket offices. From the New Year they are being told that they have to pay for a fax if to Belarus or Russia, if their destination is served by a coach belonging to the railway company of either of these countries, and that it may take seven days before they receive an answer informing them whether they have been granted a reservation. Of course, this new improved service is considerably more expensive than the system that was operated before. 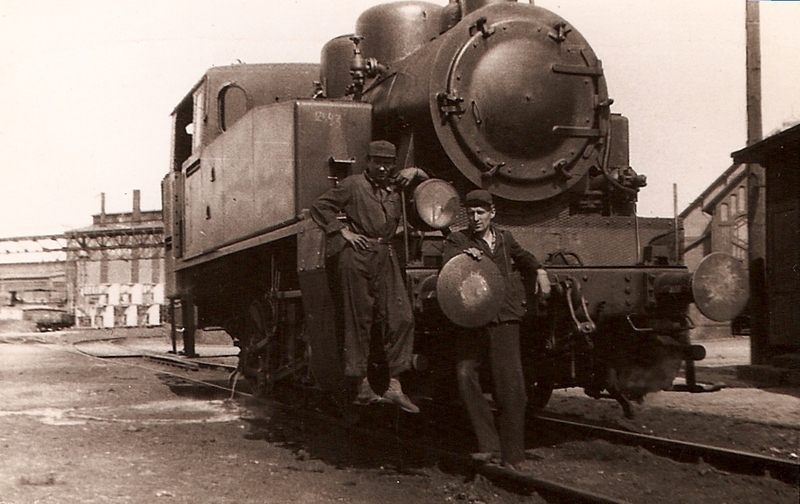 Fireman and Driver pose in front of their loco, but where? Mystery photo 1 baffled all our readers, so here is another picture, this time showing a little more of the background. So now for 8 points only, where was this photo taken? Part of a Zubrowka bottle. Photo Bartender. Dyspozytor toasts all Behind The Water Tower’s readers with a glass of szarlotka – a potent cocktail comprising 4 parts chilled apple juice to 1 part Zubrowka taken straight from the freezer. As well as hoping that you have as successful a 2010 as possible, I hope that you might make it to Poland this year and that perhaps some of us will meet up at the Smigiel Railway’s 110th anniversary celebrations in mid September. Gavin Whitelaw who runs the Vintage Images website writes to remind me that it’s been a long time that since our last competition. Well that’s partly because John Hyde, who won our last competition many moons ago, left us an e-mail that does not seem to work. John, if you are out there somewhere, do please contact either me via my e-mail: railfan [at] go2 [dot] pl or Gavin (who kindly donated a couple of bottles of Zubrowka as prizes) on his e-mail: gavw [at] btopenworld [dot] com so that we can deliver your prize. So here is the first puzzle picture of 2010. The picture was taken in the 1950s, I believe. I myself visited the location in the mid-60s when diesels had taken over the regular duties, but a couple of the steam engines had been retained as spares. So for 10 points – where was this picture taken? Spotlessly clean 0-6-0T shunting locomotive. in the 1950s, but where?